Erum Jiva is a Board certified Adult Gerontology Nurse Practitioner. 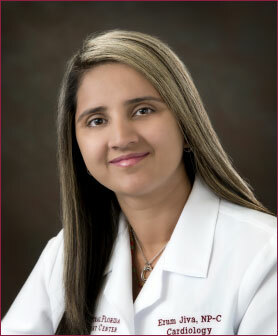 She has extensive experience of Nurse Practitioner clinical in Primary care, Internal Medicine and cardiovascular with renowned Doctors and Nurse practitioners of Ocala, Florida. Erum attended top nursing school, Aga Khan University Hospital, affiliated with Mc Master University in Canada. Then she moved to Florida where she graduated as ARNP from Kaplan University. She has altogether 10 years of experience of Intensive care (Medical, surgical, trauma, cardiovascular, neurology, nephrology and endocrinology). In addition she also has 3 years of experience as Nursing Instructor. During her career she was part of many researches and leadership programs. She has extensive experience with patients of different health disorders including hypertension, diabetes, COPD, obesity, hyperlipidemia, thyroid disorder, coronary artery disease, congestive heart failure, venous insufficiency, peripheral arterial disease, pacemaker, atrial fibrillations etc. Erum is a compassionate, warm practitioner. She has bright smile, a great listener, and has a wonderful personality. Her approach to treatment emphasizes patient communication, letting her patient feel that their concern are being understood and ensuring that treatment options are fully explained. She always “try to take care of patients like they are the member of family”. Erum focuses on preventive measures. She is working very actively in the community and run wellness clinic for church. She also conducts health education session for church people to promote awareness in community. Approximately 25 million people in the United States suffer from venous reflux disease (the cause of varicose veins). Patients with venous disease may have painful varicosities, leg swelling, ulcers, and/or leg heaviness and fatigue. Utilizing the latest RF technology, CFHC’s board-certified cardiologists, Drs. Joseph R. Alonso, Tong Liu and Lan Luo, are now able to provide a safe and effective treatment option for patients with venous disease. The VNUS Closure procedure is a comfortable alternative to vein stripping and is performed in the office setting. Most patients are able to resume their normal activities within 1-2 days and report a noticeable improvement in their symptoms within 1-2 weeks following the procedure. For further information regarding this innovative procedure, you may contact the office of Dr. Joseph R. Alonso at 352-861-9811, Dr. Tong Liu 352-873-4733 or Dr. Lan Luo at 352-873-9557. Central Florida Heart Center is pleased to announce that it has achieved accreditation in Nuclear Cardiology (ICANL) and Adult Echocardiography (ICAEL) by the Intersocietal Accreditation Commission. Accreditation means that CFHC has undergone a thorough review of its operational and technical components by a panel of experts. ICANL and ICAEL grants accreditation only to those facilities that are found to be providing quality patient care, in compliance with national standards through a comprehensive application process including detailed case study review. Accreditation is a “seal of approval” that patients can rely on as an indication that the facility has been carefully critiqued on all aspects of its operations considered relevant by medical experts in the field of Nuclear Cardiology and Echocardiography. Patients should remain vigilant in making sure that their Nuclear Cardiology and Echocardiography procedures are performed only by accredited laboratories. CFHC remains committed to providing unsurpassed cardiology care to our patients. Our accreditation in both Nuclear Cardiology and Adult Echocardiography is just one more reason you should trust your healthcare to the physicians of CFHC.